Kermit described Dudley Moore as one of the “brightest stars of music and comedy,” and, with his huge success in the comic film 10 later that year (appearing with Bo Derek and Jim’s friend Julie Andrews,) it was clear Moore was a good choice as guest star on The Muppet Show. An accomplished musician, singer and comedian, and having had early success with the celebrated British revue “Beyond the Fringe”, Moore bridged the comic sensibilities of both US and UK audiences. 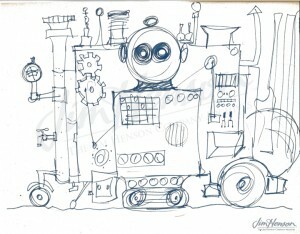 In a nod to his musical prowess, the show featured a robot called MAMMA (Music and Mood Management Apparatus) that could create a score for any type of scene in any style. The Electric Mayhem were naturally threatened, but all was forgiven when they backed Moore up in the finale, the jazzy composition “How High The Moon”. 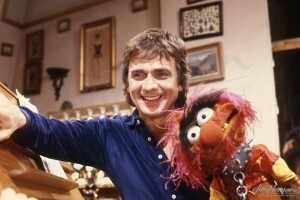 Dudley Moore with Animal on The Muppet Show, 1979. 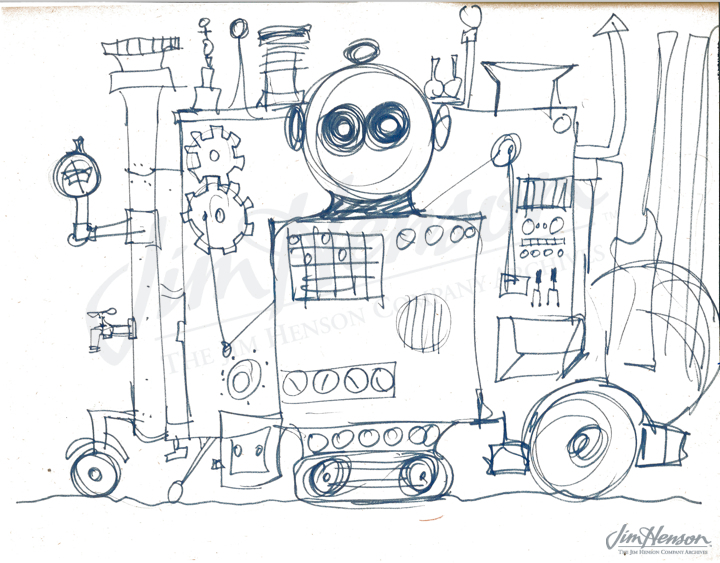 Jim’s sketch of one of his many robot concepts, 1964. This entry was posted in 06-June '79, 1979, Muppet Show and tagged Bo Derek, Dudley Moore, Julie Andrews, Kermit, The Electric Mayhem. Bookmark the permalink.